Damn it's been a hot minute since I've done a homeware/lifestyle (ish) post! I'm such a lover of buying and styling home decor, and recently I've been slowly but surely changing up my room and it's finally getting there. About a month ago I took the plunge and painted my bedroom white, and since then I've gone crazy with the decorations, so I thought I'd give you an insight into my favourite part thus far - my bedside table! The bedside table itself is from IKEA I believe, but I actually repurposed it from our bathroom to use as storage for my skincare, amongst other general lifestyle bits. If you couldn't already tell, I'm a little bit obsessed with marble; I picked up a huge roll of marble contact paper and adhered this to the top of my table, as well as on the drawer handles to add a little more interest to it as a whole - this took about 5 minutes and the end result looks much more eye catching (and expensive!). 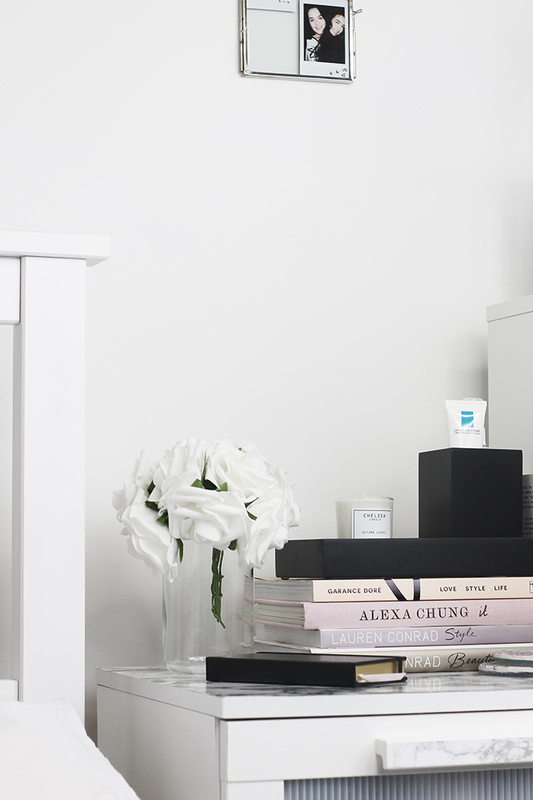 In terms of what I actually keep on top of my bedside table, I like to keep things pretty clean and minimal. I have here some of my favourite 'coffee table books' (which are also super handy to use in blog photos, may I add) in case I fancy an evening read or am looking for a little inspo, it also looks pretty which is always a plus. The overall 'theme' of my new and improved bedroom is white, black and grey/silver. I thought this Black Tray and Tumbler/Vase/Holder from Amara.com would go perfect on top of here to balance out the grey and white, and pull the colours together. 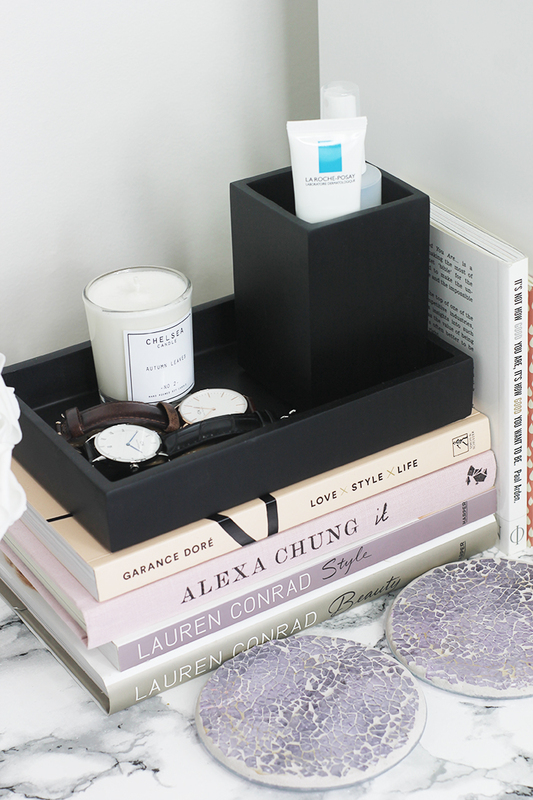 In the tray I love to store my Daniel Wellington watches, and my favourite candle from Chelsea Candle Co, this 'autumn leaves' scent smells like a man's cologne and I'm in love. I also keep my day to day skincare essentials in the tumbler so I can just quickly grab them in a morning and at night. The fake roses I have are from Amazon and were about £3; I really do love the look of flowers in a bedroom, but I'm waiting for Peony season, and I'm also hopeless at keeping plants alive..we've all been there! The coasters I have are an absolutely stunning broken glass and stone effect, and I actually nabbed them from the kitchen (I bet my mum just LOVES me), they're from a local shop near me and they are just too beautiful. As for my everyday skincare, I keep it extremely simple as my skin is just so sensitive I don't want to overdo it. I've been addicted to the Mario Badescu Rosewater Spray over the past couple of months, it's great at toning the skin whilst making it feel plump, fresh and full of moisture. 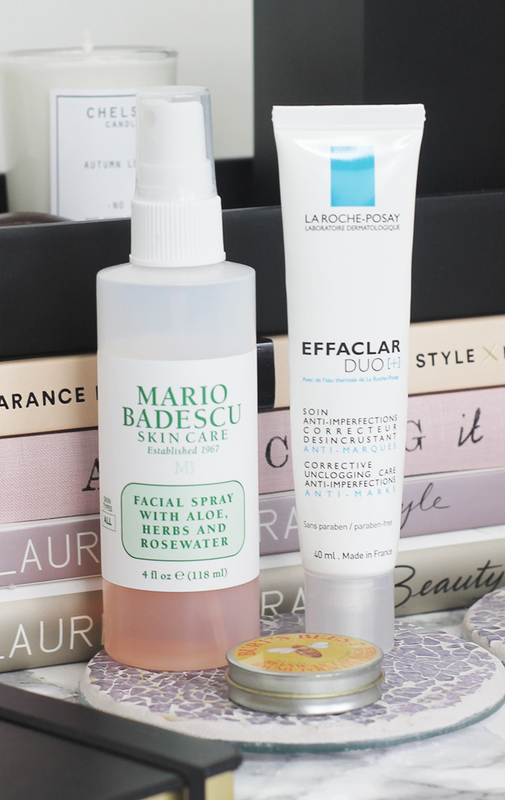 My ride or die La Roche-Posay Effeclar Duo+ also deserves a mention, this has improved and evened out the discolouration in my skin, whilst helping eliminate blemishes. And of course we can't forget lip balm, I'm not too fussy when it comes to this but Burts Bees has always been my balm of choice, it doesn't have a shine to it so it's great for application under lipsticks. And of course no blogger bedside table is complete without a notebook! 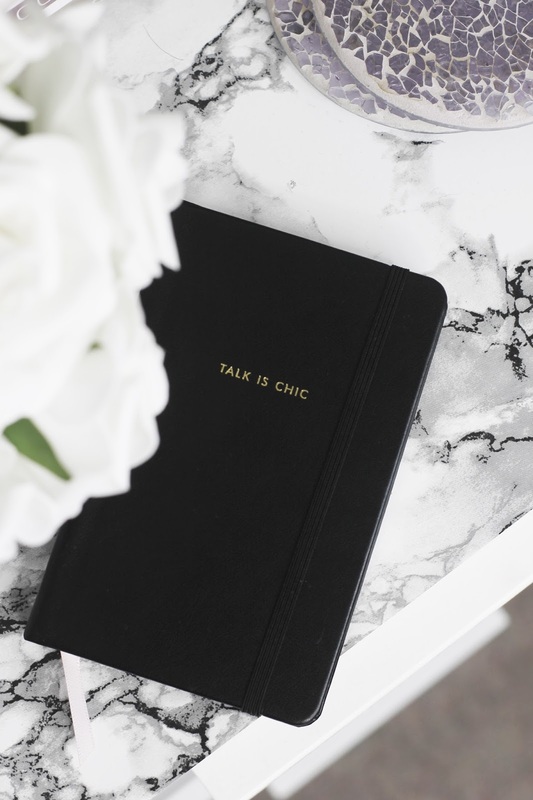 I usually get my inspiration for blog posts at the most random times throughout the day, so I'm always sure to keep a pen and paper by my bed (as well as in my handbag) in case the creative juices start to flow! This one is probably the prettiest notebook I own and it's from Kate Spade, again I got this through Amara.com. And there you have it, that's everything I tend to keep on my bedside table! I always find these really interesting to read as everyone is so different so there's endless possibilities! What do you keep at your bedside?